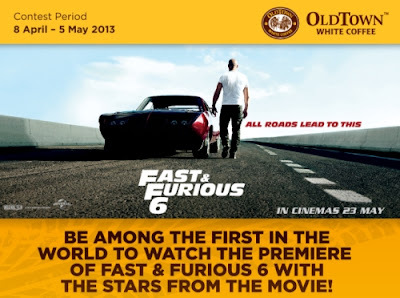 Grand prize: 3D2N for 2 to Manila, Philippines to watch the Asian Premiere of Fast & Furious 6 on 15 May 2013. Runner Up x 5: 2 movie voucher for Fast & Furious 6 @ GSC Cinemas. Consolation prize x 20: 1 pair complimentary voucher open to any asterisk movies at GSC cinemas. Enjoy set meals with partners at OLDTOWN White Coffee outlets. Snap a photo of you and your partner at OLDTOWN White Coffee & upload to the Facebook app. Caption your photo in 10 words or less including the phrase "OLDTOWN White Coffee"
Pictures with the most number of votes will be shortlisted for final judging based on caption. Keep the receipt of your purchase for verification purposes. Visit OLDTOWN White Coffee Facebook fanpage for more details.